Promote a healthy, active lifestyle for your cat with the veterinarian-formulated ingredients found in Dr. Elsey’s clean protein. Try all nine of our high protein, whisker licking good paté flavors. Our delicious canned recipes offer cats of all ages a simple way to get balanced nutrition plus added moisture. Our wet food incorporates high-quality animal-based proteins or fish as the primary ingredients. Want to get even more protein in your cat’s diet? Try out some of our high-protein kibble with over 90% animal-based proteins. Dr. Elsey’s clean protein emulates a cat’s natural carnivorous diet. Protein helps control hunger and maintain healthy body weight. Cats get very little carbohydrates in the wild from eating grass and plants for fiber. Cats do not normally eat grain, rice, vegetables, and fruits. Protein is an important nutritional profile in your cat’s diet, with animal proteins having the highest biological value (BV) as compared to grains, fruits, and vegetables. 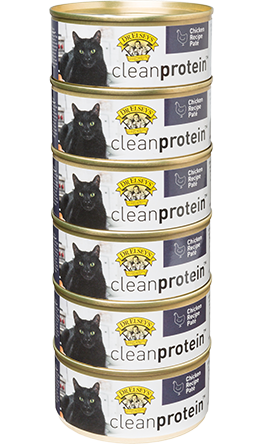 Dr. Elsey’s clean protein helps promote a healthy, active lifestyle for all cats. At Dr. Elsey’s we put the true needs of a cat in the bag before you pour them out. The primary ingredients in Dr. Elsey’s clean protein are among the highest biological value proteins, emulating a cat’s ancestral diet. Think your cat’s food is unique? Pick up a bag of comparable dog food and you will most likely find that the ingredient profiles and guaranteed analysis are very similar. The instinctual diet of a cat should be derived from animal based proteins, not plants and filler ingredients high in oxalate. Our feline friends require over 36% protein to prevent muscle wasting and over 50% protein to promote an ideal body mass. Cats are not carb-friendly and their ancestral diet is comprised of less than 6% carbohydrates. A small dog's ancestral diet includes around 14% carbohydrates percent of total diet. The right diet for your cat can go a long way in the prevention of calcium oxalate in the urine. Dr. Elsey’s clean protein diet is 95% animal-based protein. This is important in that plant material is high in oxalate and it has been estimated that 10 to 50% of urinary oxalate is derived from dietary oxalate. Dr. Elsey’s clean protein was inspired by the protein levels found in natural prey. Dr. Elsey’s clean protein has low oxalate by excluding plants commonly found in competitive diets to help ensure healthy kidney function and an active lifestyle. What is Oxalate and Why Does it Matter? Oxalic acid is an organic acid produced in animals and plants when sugars and other carbohydrates and carbon sources (protein) are metabolized. Your body and your pet’s body obtain oxalates in two ways, some is absorbed from your diet and some you manufacture in your own body. As a leading cause of death in felines, Chronic Kidney Disease (CKD) is one of the worst outcomes a cat owner can face. Research has shown that the prevalence of Chronic Kidney Disease (CKD) to be even higher than previously believed, with 50% of cats of all ages and as many as 80.9% of cats 15 years of age and older diagnosed with CKD. You are what you eat is an old adage that always bears the test of time. That adage applies to your cat’s diet as well. At Dr. Elsey’s we put the true needs of a cat in the bag before you pour them out. All of our products are scientifically inspired and crafted with care.